PT Waskita Beton Precast Tbk - Waskita Precast (IDX : WSBP) is a well-established public-listed precast concrete producers in Indonesia. Waskita Precast is the producers of high quality precast concrete products which include precast building and bridge, preacast retaining wall, precast drainage, precast readymix and other precast products. Waskita Precast is a directly-owned subsidiary company of state-owned construction firm PT Waskita Karya (Persero) Tbk (Waskita Group). At present, PT Waskita Beton Precast Tbk is 59.99% owned by PT Waskita Karya (Persero) Tbk, 0.01% by Waskita Cooperative and 40% by general public. 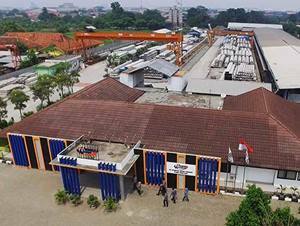 Headquartered in Jakarta, Waskita Precast now has 30 precast plants/batching plants/stone crushers spread across Indonesia. In the third quarter of 2016 (3Q16, ended in 30 September 2016), Waskita Precast succeeded in achieving acceptable and sound growth. According to PT Waskita Beton Precast Tbk 3Q16 Financial Report as quoted by JobsCDC.com, Waskita Precast registered total revenue of Rp 3,066.47 billion in 3Q16. This figures reflected an 89.67% increase from Rp 1,616.73 billion in the same period at previous year (3Q15). Minimum 1 year of experience in the related field. Fresh graduate candidates are highly welcome. Maximum age of 24 years old (fresh graduate) or 27 years old (experience). Strong communication and data analysis skills. Minimum 2 years of experience in the related field. Fresh graduate candidates are highly welcome. Maximum age of 24 years old (fresh graduate) or 28 years old (experience). Mastering Microsoft Office and CAD (minimum 2D). Strong knowledge of construction and building materials. JobsCDC.com now available on android device. Download now on Google Play here. Please be aware of recruitment fraud. The entire stage of this selection process is free of charge. PT Waskita Beton Precast Tbk - Fresh Graduate, Experienced Staff Waskita Group March 2017 will never ask for fees or upfront payments for any purposes during the recruitment process such as transportation and accommodation.